UCLA eased by Arizona on Saturday. 5 The road teams won every Pac-12 conference game on Saturday, including a pair of matchups between ranked opponents. Not only that, they completed dominated on the scoreboard, outscoring the home teams 232-112 this week. That's an average of 46.5 points per game by the away team. While the road teams triumphed, the home teams have yet to produce a single win in the six conference games this season. Oregon suffered its worst loss since 1985 thanks to Utah's 62-20 rout in Eugene. Arizona couldn't contain Paul Perkins and UCLA in its 56-30 loss. While Week 1 had its struggles, Week 4 definitely showed that Pac-12 has several playoff and national title contenders. 10 Florida successfully converted all five of its attempts on fourth down, including the game-winning touchdown, against rival Tennessee. Will Grier threw a 63-yard touchdown to receiver Antonio Callaway on a 4th-and-14 play to comeback and win 28-27 in Gainesville. The Gators have been perfect on fourth-down this season and while six other schools are also perfect, none have come close to Florida's 10-for-10 rate, which is the best in FBS. 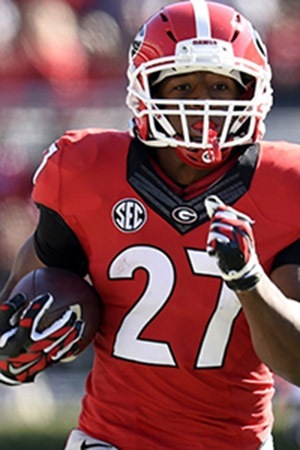 12 Nick Chubb recorded his 12th straight game with at least 100 rushing yards in Georgia's win 48-6 over Southern. The sophomore running back tied the record set by Heisman winner Herschel Walker from 1980-1981. Chubb can be in sole position of the record if he rushes for 100 yards against an Alabama team that has the No. 4 rushing defense in the country. 105 While Michigan's offense scored 31 points, the Wolverines' defense should receive credit for the shutout win over formerly-ranked BYU. Michigan held Tanner Mangum and the Cougars to just 105 yards of total offense. It was the first time since 2012 that BYU failed to surpass 200 yards of offense. But that's not the Wolverines did: their defense didn't allow BYU to cross their 40-yard line and allowed only four third-down conversions on 15 attempts. 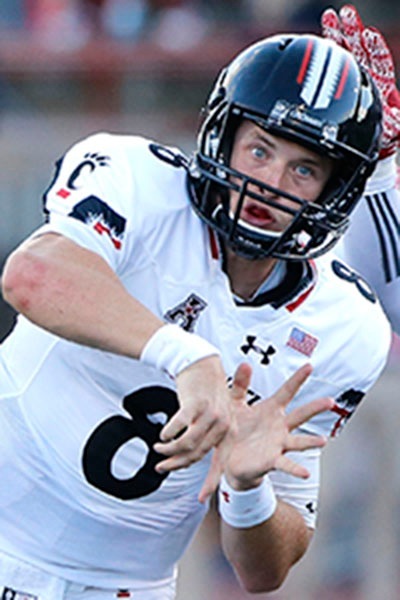 557 Cincinnati freshman QB Hayden Moore set a program record with 557 passing yards in the Bearcats' loss to Memphis. Moore broke the previous record (554 yards) set by Greg Cook against Ohio more than 47 years ago.The freshman completed 31 of his 53 passing attempts (fifth-most in school history) and threw for four touchdowns and a pair of interceptions. 1,357 It was an offensive shootout in Lubbock between Texas Tech and TCU in the Horned Frogs' 55-52 win over the Red Raiders. Just look at these numbers. The teams combined for 107 points and 1,357 yards of total offense. Fourteen touchdowns were scored and only seven series ended with a punt. In a battle of the quarterbacks, Trevone Boykin outdueled Patrick Mahomes with 509 passing yards compared to Mahomes' 392 yards. Meanwhile, TCU receiver Josh Doctson caught for 267 yards on 18 receptions. 0-9 Bret Bielema has lost nine games decided by seven points or less while at Arkansas. ... 1-3 Texas starts the season 1-3 for the first time since 1956. ... 2 Teams that are ahead by 13 points or more in the fourth quarter have gone 188-3. Two of those losses belong to Tennessee. ... 9 Notre Dame scored 28 points in a span of 9 minutes and three seconds in the win over UMass. ... 16 Boise State's defense scored 16 points, two points more than opponent Virginia scored all night. ... 25 Duke has held its opponents to under 25 points in 14 of its last 16 games. ... 31 Kansas has lost 31 consecutive road games, the longest streak in the country that dates back to 1978. ... 54 Memphis has scored almost 54 points per game in its four wins this season. ... 58 Army scored its most points since 2006. ... 62 Utah's 62 points were the most Oregon has allowed at home in Autzen Stadium. ... 244 Leonard Fournette's 244 yards against Syracuse is a LSU record for most yards by a running back on the road. ... 440 Bowling Green QB Matt Johnson has averaged 440 passing yards in four games this season and is on pace to surpasses 2,000 yards in Week 5.